Cyn: Russia plans to change the course of an asteroid that will come close to earth in 2029. One of the ways to do this is to literally fire missiles at the asteroid. I built a model to simulate it. 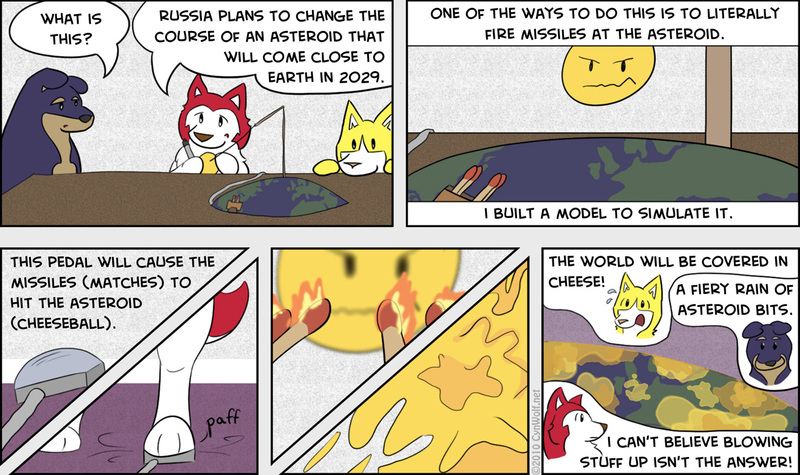 The pedal will cause the missiles (matches) to hit the asteroid (cheeseball). Bingo: The world will be covered in cheese! Argent: A fiery rain of asteroid bits. Cyn: I can’t believe blowing stuff up isn’t the answer!